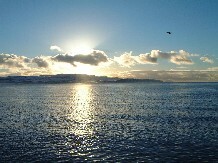 Ayr Harbour is best approached from its south side along the beach front. Drive to the beach front and head northwards towards the harbour, following the beach all of the way. There is limited parking and a turning space (do not block the turning space). The harbour has appeal at different times of the year. Park on road (not ideal), metalled/paved level surfaces. National Cycle Route 7 passes both sites. During winter months scan the wooden posts on the north side of the harbour for Purple Sandpiper , as this is a high water roost supporting up to 70 birds. The harbour itself can offer protection for many birds. Seeing Red-throated Diver , Red-breasted Merganser , Eider , Scaup and Goldeneye at the western end of the harbour, near the mouth, is not uncommon during the winter. A walk to the end of the pier can usually reveal Rock Pipit and occasionally other passerines e.g. Stonechat , Robin . Check the big boulders on the south side of the pier for close views of Purple Sandpiper . A scope is useful to scan the sea for birds from the end of the pier. The tower can offer some protection from wind. Scanning the sea from south to north can produce some interesting birds, though this is often weather dependent. The best time to scan in winter is on a cold still day in the morning. It is possible to see all three divers, as well as big rafts of Scaup and Goldeneye and smaller groups of Long-tailed Duck . In very cold weather when the inland lochs are frozen keep your eyes open for other wildfowl such as Smew and grebes. The sewage outflow at Blackburn Rocks (south) and Newton Shore (north), both visible from the end of the pier, are worth scanning for wildfowl. The breakwater has Cormorant and Shag on it most of the time. With easterly or north-easterly winds the Purple Sandpiper occupy the western side of the breakwater, making them invisible to watchers from the pier. Choose time and weather well to see them. 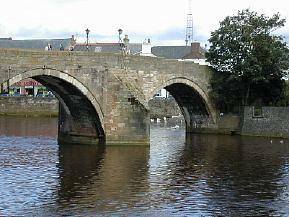 Glaucous and Iceland Gulls can be found in the harbour, though for a better view go into Ayr to the Auld Brig area and scan the multitude of gulls that gather there. Good, close views of these gulls can occasionally be had. The Auld Brig area also has large numbers of swan, mostly Mute (80+) but occasionally there are Whoopers and the odd goose. There is parking right beside the bridge though this tends to fill up quite quickly, alternatively use the Asda car park. Note of caution: In strong south-westerlies the pier is often subject to waves battering it and exploding over the pier. This makes a visit out to the end of the pier very hazardous. It is not recommended to venture out on the pier in such conditions, besides which you are unlikely to see anything! Ayr harbour has breeding Black Guillemots . In summer months Gannet , Guillemot and Razorbill can be seen from the end of the pier and with a westerly or south-westerly so can Shearwater , usually Manx , though these are better seen in autumn. With perseverance and warm clothes, westerly or south-westerly winds providing the best conditions, rarer sea birds may be seen in autumn.